Up until recently, I had never been a fan of Ben Folds. In terms of Singer/Songwriter I had put my energies into much more solemn examples like Elliott Smith, John Lennon, Jim Sullivan and the occassional Cat Stevens Yusuf Islam. My girlfriend however, SWEARS by her adolescence on a copy of Whatever and Ever Amen. 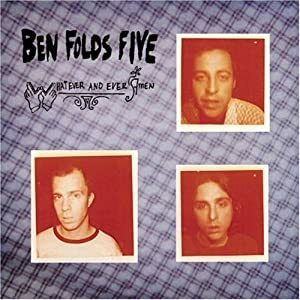 When the news broke that Ben Folds Five was reuniting for their first tour since the 1999, I knew I had to buy tickets. A few weeks ago I burned this album onto a CD and took it on a road trip up to Boston. DAMN was I impressed. Talk about being 15 years late to the party, but in this case (as in most cases) better late than never. Something about the hard percussive piano and raucous fuzzy bass played over jazzy drums just brings Folds' storytelling to a beautiful life. Here are a few jams from one of the better Composers of our generation. I am beyond excited for tonight's show in Central Park.